The next iteration of Google's mobile OS was unveiled earlier this year with nothing more than the letter "L" as its designation. Anyone familair with Android will be aware that the major releases proceed in alphabetical order and are named for some kind of sweet or desert: KitKat, Jelly Bean and Ice Cream Sandwich being the last three. Well, the search giant just went a long way to confirming that Android L will stand for Android Lollipop thanks to an animated GIF the company posted for its 16th birthday. Topped with lollipops. 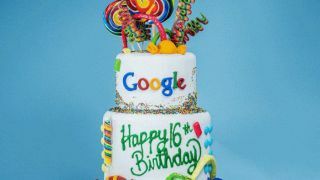 Until 2005, Google counted its birthday as September 7 - the day it was incorporated - but now hinges it on the day it first announced the amount of pages it has indexed. While Google counts September as its birth month, October is likely to be very busy for the company with both the Nexus 6 and the Nexus 9 tablet rumoured to appear and the rollout of Android Lollipop. We've already seeen some of what the new OS can do from Google's I/O conference back in August, including a the new 'Material Design' look and a greater focus on voice. Early rumours have suggested an official release could be taking place on November 1. Read everything we know about Android L so far.